You can structure and organize with the list feature all project information even before generating work packages and a timed project plan. On the Start tab click List. On this page you find a new list. On the Edit tab, in the List group click Edit List. Tape a name into a Name field. Activate the Visible only to me box to hide your list from other users. In the Fields area you can add a new field that will be overtaken for the new entry in the list. In the New Field dialog box type a name in the Name field. Choose the type from the drop-down list. Use Down and Up arrows in the Fields area to define the order of the fields. In the Relations area you can add a link to the other elements from the project sides. In the Assign Relation dialog box click the wanted tab. Select the needed project element. 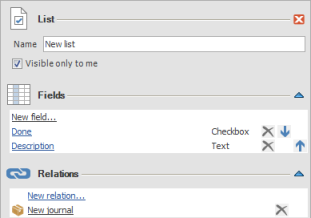 The assigned relation is now displayed in the Relations area. With one click on it you can open the related project page. You can delete each project from the group by clicking remove symbol. How to create a new to-do list | InLoox PM 8 • Copyright 1999-2019 © InLoox, Inc. All rights reserved.